5 Results exactly matching the search phrase. 37 Results matching product descriptions. 4 Results matching title or description. 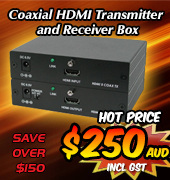 The DVI to HDMI Converter with Digital Audio is designed to combine and convert a DVI (digital video) signal and an SPDIF (digital audio) signal to one combined HDMI output signal, allowing Users to connect a DVI video source and a digital audio source to an HDMI digital display. The DVI PC/HD to HDMI 720p/1080p Scaling Converter allows you to connect a PC/DVI device, such as a set top box or DVD player, to a High Definition Display and it will also upscale the video signal to a higher resolution for a better viewing image on your TV. 4k2k HDMI EDID Emulator is designed to allow adjustment of an HDMI or DVI display's EDID (Extended Display Identification Data) information. This is the information provided to the source device (eg DVD player or Set Top Box) so that the best video and audio signal can be automatically selected for display. It also supports EDID Emulation and By-pass Modes. The HDMI UHD 4k2k Audio Inserter allows the User to add an external digital or analog audio signal with an HDMI or DVI (via DVI/HDMI adaptor) digital video signal, combining and synchronising the signals into one new digital video/audio signal. Insert Stereo or Multi-channel Surround Sound audio formats into HDMI/DVI HD and 4k2k UHD video signals to best suit your requirements. The HDMI UHD 4k2k Audio Inserter supports High Definition resolutions on input and output up to 1080p and 3D, plus Ultra High Definition 4k2k. 4K UHD+ Audio Inserter is designed to insert an external analog or digital audio signal into an HDMI or DVI (with adaptor) source signal to generate an HDMI compliant output with new audio. The DVI Splitter 1 In 4 Out is a high performance HDCP compliant DVI distribution amplifier. It allows a single DVI signal source to be split into four separate and identical buffered Outputs for multi-viewing purposes. HDMI sources and displays are compatible by using a HDMI to DVI adapter cable. The 4K UHD+ HDMI Scaler is engineered to scale up a wide range of HDMI and DVI resolutions, and to output a new signal at a selected HDMI or Ultra High Definition 4K resolution.